Find Hollander Boutique Hotel deals, discounts and special offers. The Renaissance Vinoy has a private marina, tennis, pools, and is located in a 1920's historic building. Located on the waterfront of St. Petersburg, this Hilton has 333 rooms and suites. This b&b is in a residential area, and has antique-filled sitting rooms, piano, books, and movies. Located in a historic district of St Petersburg, this four room bed and breakfast features a gazebo covered hot tub. This twelve guestroom bed and breakfast offers internet access and most rooms have oversized whirlpools. The inn features 12 rooms in two restored homes and a carriage house built in the early 1900s. Located near downtown St. Petersburg, the inn features 5 guest rooms. Located in the downtown waterfront district of St. Petersburg, this B&B is within walking distance to the Bayside Beach. The hotel is located next door from the Carillon Office Park Complex, and convenient to the area airports. The hotel is situated close to Salvador Dali Museum, Mahaffey Theater, and Jannus Landing. 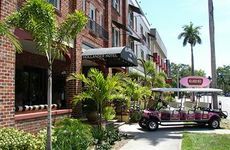 Within walking distance from this non smoking hotel, guests will find the Museum of Fine Arts, and the Mahaffey Theater. The hotel offers a convenient location for attending many area events, such as Women's Half Marathon. Situated in a convenient distance from the airport, the hotel is a Florida Green Lodging Certified member.